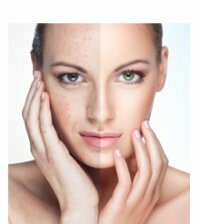 Acne can be a real problem for your self-esteem, but it turns out that acne could very well be the result of emotional issues and can be resolved by clearing them. By utilizing a wonderful tool called EFT (Emotional Freedom Techniques), you can clear up the emotional issues that cause the problem therefore creating a healing of the physical issue. As a clairvoyant healing practitioner I have found that many physical problems are the result of emotional issues. In my sessions, I look for the patterns that have caused the physical issue, and very often, it's emotionally based. I often share common causes on my facebook page, and in my free eBook, so be sure to check that out. The EFT statements below utilize Louise Hay's emotional interpretation of the physical problem. My free eBook will teach you how to use EFT if you are not familar with the technique. If you need help determining a cause, it can be of great benefit to experience a healing session with me. I can look for the cause and the physical pattern itself, sending healing energy to both. When you download my free eBook, you will receive an offer to experience a healing session at the introductory rate of $60. You will also learn how to use EFT to clear these patterns yourself. Learning EFT can help you in many areas of your life and it's a tool I recommend using to clear negative emotions to create healing. If you are familiar with EFT, you can try the EFT setup below. If the cause mentioned in the EFT statements below does not resonate with you, you might want to schedule a healing session with me. Again, I can find the patterns that have caused the problem and send healing to that pattern in addition to sending healing to the physical issue itself. This may result in a complete healing as a cascade of healing energy coming forth from the time the problem started until the present moment. If you are attempting to tackle this yourself, the first thing you want to do is to clear the negative emotions the acne has created, such as "feeling unattractive". Once we "deeply and completely accept ourselves" in spite of the acne, and clear the core emotional cause of the issue, it may clear up immediately or a remedy will be discovered. I have discovered remedies and cleared up many issues, including acne, by following 6 steps I teach in my Consciousness 101 Course. This course can help you ensure success in this and ANY other area of your life and the self-study course is only $14.44 for a year of access to the online course. Now onto some EFT statements that may help you clear the emotional cause of acne. If you are not familiar with EFT (Emotional Freedom Techniques), this probably won't make a lot of sense to you. To learn about EFT and get more tips, tricks and insights on to how to heal yourself, get my free eBook. Sometimes an issue is purely physical, which would require the use of other healing modalities to remedy. After completing Consciousness 101, The Bright Future Workbook will take you further and deeper into healing past traumas and manifesting all that you want in your life.